RM of Rocanville residents speak with Next-Era Energy representatives at a public meeting in Rocanville last week. 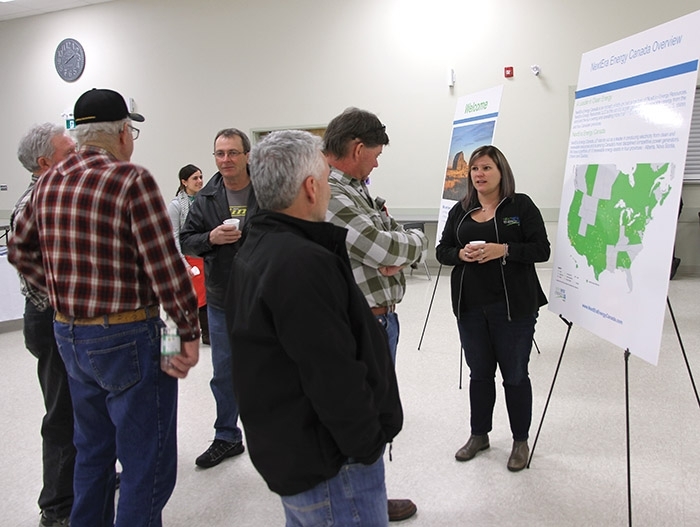 More details were released on a proposal for a wind farm in the RM of Rocanville last week. NextEra Energy is in the very early stages of developing a proposal for a wind farm west of Rocanville, near a high voltage line that carries power to the Tantallon substation. NextEra is the world’s largest producer of power from solar and wind. It operates solar, wind and nuclear power plants across four Canadian provinces and 30 states. David Lawlor of NextEra told the Rocanville meeting that SaskPower’s plan for 50 per cent renewable energy by 2030 includes plans to buy 1,600 megawatts of wind power. SaskPower expects individual wind farms in the 100 mw to 200 mw range. A 100 mw wind farm would include 25-30 towers, a 200 mw farm would have 55-60 towers. NextEra submitted a Request for Qualifications bid to determine that they are qualified to bid on supplying that power, and the company has qualified. Lawlor said the Rocanville project isn’t advanced enough to bid into the first request for proposals. “This project is not advanced enough to bid into this current SaskPower process,” he said. “You need one full year of meteorological data. We have our bases for our met towers being installed. “We will be setting up two met towers. They will be erected at the end of this year or early next year. He said the location near major power transmission lines makes the area attractive for wind development. He said the company has secured some land in the area, but not enough to create a project yet. Successful bidders will sign a 25-year power purchase agreement to sell power to SaskPower. Lawlor said the Rocanville project has the potential to bid into a SaskPower request for proposals in 2019 or 2020. If the project wins, it would be in service in 2022-2023. Lawlor said a bylaw passed in May by the RM council has a limitation on turbine height which could be problematic for the project. “As technology has improved, turbines have become taller,” he said. “We want to get turbines up out of the way of obstacles that cause interference. “We’re now looking at towers of 110 metre height and rotor diameter of 130 metres, or 65 metre blades. Lawlor said he is hopeful the project can go ahead. “There is benefit to the overall community,” he said. “It provides very local jobs, provides millions in landowner lease payments, it allows land to remain in agricultural use. In response to a question from the crowd, Lawlor said NextEra has other projects in development in Saskatchewan. In response to another question, Lawlor said the focus on Saskatchewan would be on wind, not solar. “Right now Saskatchewan has a 10 mw opening for solar, but wind is still more inexpensive,” he said. One person at the meeting asked if the wind towers would be connected to the grid with overhead or underground wires. One landowner asked if oil drilling would be permitted on land with wind turbines. One person asked about the separation of wind towers from homes. “Our internal is 500 metres, but it’s not uncommon to be 700 or 800 metres from a residence,” he said. “We do a lot of stuff before building to make sure there isn’t a noise issue. One person asked if there has ever been an issue where a wind tower will fall over in a tornado or plow wind. One question was whether icefall from the blades is a problem. “Alberta and Saskatchewan are less moist areas, but you can heat the trailing edges on a blade to avoid icefall,” said Lawlor. One person asked about decommissioning windfarms 25 or 40 years down the road. One person asked about the advantages of NextEra over other companies developing wind farms. One person questioned why the company sent land agents to sign up land owners before approaching the RM. “If you look at the way the RFP is set up with SaskPower, you have to demonstrate land control,” said Lawlor. “You have to have the agreements in place. “We don’t usually at this early stage have a full public meeting. “There’s a land rush right now. There are a lot of companies out there—we need to get the land now or we’re not getting it. “If we can’t get enough people on board, we need to go to a different area. If we’re not here, it might be Algonquin or someone else knocking on your door.